Alan and Sharon Campbell are the Directors/Founders of "Refuge Ministries Canada". Since accepting Jesus Christ in prison in 1983 Alan has remained completely clean with a full pardon from Correctional Services of Canada and has ministered in prisons/churches across Canada and Internationally. Alan is ordained with The Apostolic Church of Pentecost. They live in London, Ontario and attend "Faith Alive Family Church" in London,Ontario under the leadership of Pastor Mark and Anita Glaab. 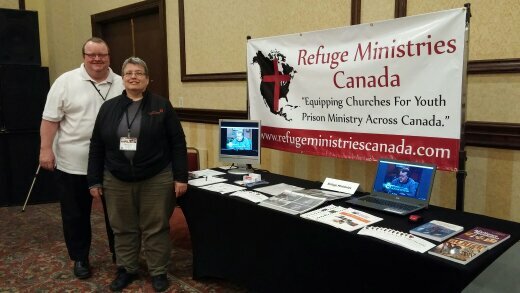 Alan and Sharon Campbell with ”Refuge Ministries Canada” ministry display table at the “Apostolic Church of Pentecost “ national conference in Toronto,Ontario.